This article describes the concept of Keep It Simple, Stupid (KISS) in a practical way. After reading you will understand the definition, meaning and basics of this powerful communication tool. 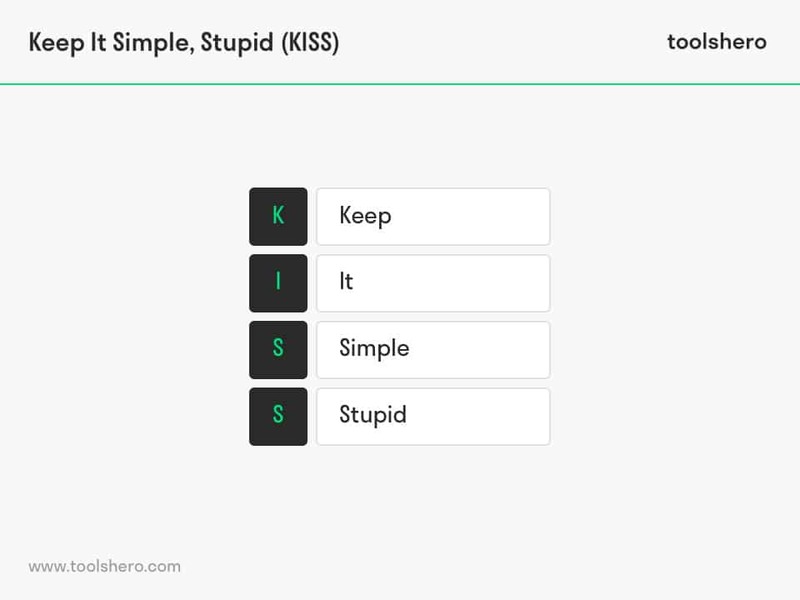 What is Keep It Simple, Stupid (KISS)? KISS is the acronym for Keep It Simple, Stupid! There are multiple versions, including ‘Keep It Short & Simple’, ‘Keep It Smart & Simple’ and ‘keep it Simple & Straight forward’. In principle all related combinations of KISS boil down to the same thing. The term originates from the world of programmers and was first used at the end of the seventies by the Dutch mathematician and computer scientist Edsger Wybe Dijkstra. Due to limited disc space, computer programmers at the time were asked to minimise the number of lines of code they used. The longer the number of code lines, the greater the chance of conflicting commands, which in turn would lead to unreliable software. By keeping codes as simple as possible, not only disc space was saved, but the chance of contradictions occurring would also be far less. The underlying idea of the KISS principle is to keep things as simple as possible in order to prevent stupidities. The KISS principle assumes that if a large group of people cannot understand a product, it will be almost impossible to use the product properly. Therefore, the intention is that the widest possible audience must be able to understand how it works immediately. For example, lengthy user-manuals of smartphones have been reduced to manageable manuals consisting of practical images with short texts that explain the operation of the device. Today, the KISS principle is mainly used in the advertising, marketing and design world. Messages come across much better if all the information isn’t presented at the same time, but rather in a compact version. Slogans are powerful examples of this. The underlying idea of KISS is based on a quote by Albert Einstein: ‘if you can’t explain it, you don’t understand it well enough’. Vice versa, something can only be explained properly if the person explaining it understands what he/she is talking about. Managers also use the KISS principle to present complex models or huge data streams as simply and clearly as possible, so everyone in the organisation can understand it. The KISS principle is considered to be the key to working efficiently and fast. Most people tend to use many words to explain an important topic. The unintended consequence is that the message does not get across clearly and is not understood well. In the following examples, it becomes clear what happens if the KISS principle is not used in PowerPoint presentations, quotes and sales pitches. A jumble of words adds little to the story and the essence of one’s story will remain unclear. A classic mistake in PowerPoint presentations is that all information should be included; you wouldn’t want to forget to include certain information, would you now! However, many people do not know that a PowerPoint presentation should only be used to complement speaker’s story. More important is the knowledge the speaker has, and the way he/she conveys the story to the audience. The speaker captivates the audience with his/her choice of words and body language. All attention should be focused on him/her. A PowerPoint presentation in the background is solely intended to complement the story. If it contains lengthy texts or the exact story the speaker is presenting, the audience’s attention will quickly be lost. The audience will struggle with the huge amount of text and lose track of the story. Therefore, the KISS principle also applies to PowerPoint presentations: only use short keywords to support your story in PowerPoint presentations. Using bullet points or other symbols may help. Using a font that can be clearly read at a distance in the room will also help. Additional images may enhance the story. A PowerPoint presentation should never draw all the attention: the speaker should be the focus of attention. Sales managers often believe that the quote they give their customers should be packed with information. Nothing could be further from the truth. A quotation is the organisation’s calling card and the customer wants to be able to see the offer and the pricing at a quick glance. Nevertheless, reference can be made to the supplements, in which details can be elaborated on and drawings and images can be included. Usually, a customer who needs a significant amount of time to study a quotation, will not place an order. No matter how scary sales managers think it is to omit information in a quotation, the ‘Keep It Short & Simple’ version is most applicable in this case. Most sales people tend to elaborate a lot on how good their product is. They mention all the unique selling points (USPs), without letting the customer speak. Therefore, the sales person does not know what the customer considers to be important, what the customer wants and what his/her wishes are. Only after listening carefully, the sales person should respond with a fitting offer that is beneficial for the customer. The customer should feel that he/she is put on a pedestal and not the sales person. This will be regarded as pushy and pedantic. If the sales person uses the KISS principle, he/she will get more out of the conversation and win over the customer. In all cases, it is useful to master the KISS principle. This not only applies to businesses that want to market themselves, but also the description of business processes, complete marketing plans and working out notes and recommendations. The goal of the KISS principle is to describe and communicate a clear message. The best way to do this is by wording the message as simply as possible. This will ensure that the focus will remain on the core message and it will prevent any misunderstandings, interpretation differences and possible irritations. Simplicity should be the main goal. What do you think? Is the concept of Keep It Simple, Stupid (KISS) applicable in your daily work? Do you recognize the practical explanation or do you have more additions? What are tip for improving your communication skills?